I don't know if things have been busier than normal lately (and by "lately" I mean since January), but it's obvious my creativity hasn't been channelled through this blog. I have been knitting, although not as much as I did during my manic days. Although I doubt I'll ever get there again. 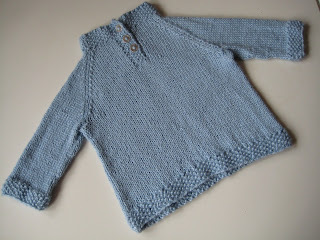 A Placket-neck Childrens pullover from Last-minute knitted gifts, for a friend's son, Lorens. 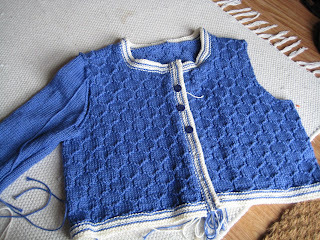 I knit it in Debbie Bliss' Silk Alpaca, less than four skeins, on 4 mm needles, size 6-12 months. Cute metal buttons from Yll o Tyll. 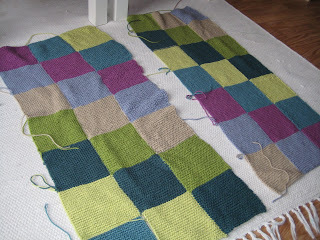 One stripe missing away from a cute baby blanket. Rowan WoolCotton, two balls of each colour, seven of them. 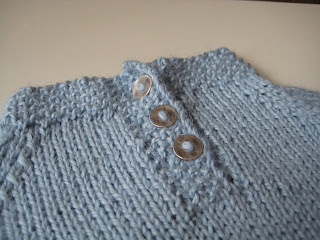 Knit on 4 mm needles with great variety in tension. Sewing it up I'm happy that every knitter has managed to knit equally many rows of each colour. Mostly. Well, that's pretty much it. Today Stockholm offers the grayest of weathers and I have dug two holes in my tiny front yard and am now building up strength (coffee and cardamom rolls) to start digging five holes in my back yard. I'm not only digging holes though, I'm also stuffing them with things. In the front yard I now have two Clematis, and in the back yard I'll soon have four Spirea betulifolia (Björkspirea) and an american blueberry plant/bush. Thanks to Fi for driving, inspiring and insisting (and paying... ;-). I know I'm not the only one who has been a bad blogger recently, and there are quite a few of my favourite blogs who haven't been updated for months. Hope you all are well and that you soon feel inspired enough to tell the rest of us what you are up to.